My week in Hawaii enabled me to see firsthand the work of five schools engaged in environmental sustainability. Here are their stories; the first three are private-independent schools, Punahou School, La Pietra-Hawaii School for Girls, and Hawaii Preparatory Academy; the two others are public schools, Palolo Elementary School, and Ewa Makai Middle School. It was an exciting moment for the environmental sustainability movement this week when California State Superintendent of Public Instruction Tom Torlakson called for a major initiative to bring solar power to California schools when he released the Schools of the Future report, which I helped to prepare this past spring as a member of his task force. In April I joined the advisory board of GEMS, world’s largest K-12 educational organization operating some 66 schools in 12 countries around the globe. In the course of a briefing about the new international private school they plan to open in New York City, I received an overview of their architectural plans to renovate a Manhattan office building as a state-of-the art, environmentally sensitive school building. As a result of this meeting, I made another discovery: the project architects, Skidmore, Owings and Merrill (SOM), are designing the city’s first Zero Net Energy school building, a model that promises to transform school architecture. 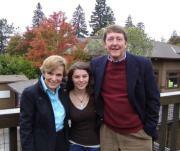 This year while serving at a visiting scholar at Stanford and UC Berkeley I had an opportunity to study the important leadership role colleges and universities are playing in the environmental sustainability movement in education. Given its stature, size, and influence, the university community has provided a powerful example for change in the K-12 school community. The case studies of Stanford and Cal, followed by shorter reports on my visits to Mills College, Princeton and Yale, sketch the outlines of some of the best green practices in higher education. In my study of the K-12 environmental education movement this year, it has become clear that the partnership between schools and the "informal" network of museums, aquariums, and outdoor programs is vital to the vibrancy of our overall educational effort. Here are reports on two of Northern California's most impressive science centers, the Chabot Space and Science Center and the California Academy of Sciences. 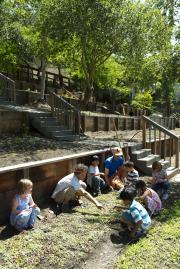 In the spring I continued my journey in search of best green practices in California public and private schools. Here are stories of four remarkable schools making a difference, in order I visited them: Katherine Delmar Burke School, Drew School, Midland School, Glenview Elementary School, and Rosa Parks Elementary School. Thus far my travels on the Green Schools Express have not taken me to my homeland in the Midwest, but I anticipate making a journey there in September. To incorporate the middle of the country on my map of green schools, I am beginning with this wonderful, "virtual" visit to the Olney Friends School in Ohio. Stay tuned for more reports this year. In late March I made another trip to the East Coast in search of best practices among a dozen schools in Western Massachusetts and Connecticut, New York, and Central New Jersey. Traveling on a chilly spring week with snow still on the ground in some parts, I visited the following schools in order of their appearance: 1. Berkshire School, 2. Hotchkiss School, 3. Millbrook School, 4. New Canaan Country School, 5. 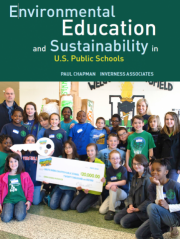 Riverdale Country School, Fieldston School, and the Green Schools Alliance, 6. Princeton Academy, 7. Willow School, 8. Lawrenceville School, and 9. Princeton Day School. This trip concluded my initial round of visits on the Green Schools Express. In February and March I visited a number of schools, colleges and organizations around the country in Maryland, Virginia and California. Here are their stories about environmental sustainability. The reports are presented in the order visited: Bryn Mawr School, Baltimore, MD; Maryland Association for Environmental and Outdoor Education MAEOE; Collegiate School, Richmond, VA; San Francisco Friends School, CA; Athenian School, CA; Saint Mark's School, VA.